HIS Royal Highness Prince Mohamed Bolkiah, the Minister of Foreign Affairs and Trade launched Tasek Merimbun – The Black Beauty of Brunei Darussalam yesterday. The book, which contains 168 pages contains information about the park, and is filled with pictures of the surroundings and its inhabitants, particularly the birds. In the book, His Royal Highness said that for us in Brunei Darussalam, for the past 30 years, everything that is contained in the ASEAN Heritage Park concept is represented by the lake known as Tasek Merimbun. 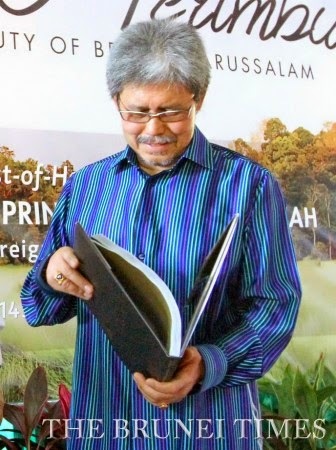 The author of the book is the Museum’s Curator of Natural History and Manager of Tasek Merimbun Heritage Park, Yang Amat Mulia Pengiran Muda Omar Ali who worked with photographer Hj Ilham Rohaidi Hj Mashud. “Through this coffee-table book, I hope to share the natural wonders of Tasek Merimbun and give a picturesque insight to readers. May this book entice more nature lovers to visit this heritage park and discover what nature has to offer,” said YAM Pengiran Muda Omar Ali. The release of the book was in conjunction with its 30th anniversary as an ASEAN Heritage Park. Minister of Culture, Youth and Sports, Yang Berhormat Pehin Orang Kaya Pekerma Laila Diraja Dato Seri Setia Hj Hazair Hj Abdullah said that Tasek Merimbun is celebrating its 30th anniversary as an ASEAN Heritage Park this year. YB Pehin Dato Hj Hazair said that the park is a breeding place for birds such the Purple Heron and various egrets as well as a destination for migrating birds. The park was also included as one of the arenas used in the First Borneo Bird Race in 2013 and is also famous for the beautiful black water lake, the largest of its kind in Brunei. The MCYS Minister YB Pehin Dato Hj Hazair also said that the park has continued to develop its attractions such as the Butterfly Garden which was set up in 2012 and has become one of the popular attractions in the park. He added that it has also received visits from researchers from institutions around the world. Since 2008, Tasek Merimbun has been the setting for an annual weeklong field course on Tropical Ecology and Conservation organised by Queen Mary University of London in the United Kingdom. The park has also played host to the Young Naturalists Programme, an annual programme aimed at Year 4 and Year 5 students from schools throughout the country. The book-launch ceremony took place at the Balai Purun of the Tasek Merimbun Heritage Park. Also present at the ceremony were the Minister of Education Yang Berhormat Pehin Orang Kaya Seri Kerna Dato Seri Setia (Dr) Hj Awang Abu Bakar Hj Apong, the Deputy Minister of Culture, Youth and Sports Datin Paduka Hjh Adina Othman and officers from the Ministry of Culture, Youth and Sports. The Tasek Merimbun – The Black Beauty of Brunei Darussalam retails at $55 a copy.